1. Follow this link and click on 'GET A KEY'. 3. Give any name you like for the project name such as the name of your website and click on 'CREATE AND ENABLE API'. 5. 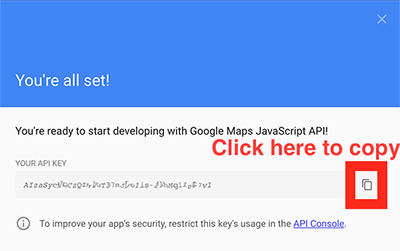 Add your new key to your Store Locator account by pasting it into the box at the top of this page and clicking the Save API Key button.